William Thomas "Billy" Murray (May 25, 1877 – August 17, 1954) was one of the most popular singers in the United States in the early decades of the 20th century. While he received star billing in Vaudeville, he was best known for his prolific work in the recording studio, making records for almost every record label of the era. Billy Murray was born in Philadelphia, Pennsylvania, to Patrick and Julia (Kelleher) Murray, immigrants from County Kerry, Ireland. His parents moved to Denver, Colorado, in 1882, where he grew up. He became fascinated with the theater and joined a traveling vaudeville troupe in 1893. He also performed in minstrel shows early in his career. In 1897 Murray made his first recordings for Peter Bacigalupi, the owner of a phonograph company in San Francisco. As of 2010 none of Murray's Bacigalupi cylinder records are known to have survived. In 1903 he started recording regularly in the New York City and New Jersey area, when the nation's major record companies as well as the Tin Pan Alley music industry were concentrated there. In 1906 he recorded the first of his popular duets with Ada Jones. He also performed with Aileen Stanley, the Haydn Quartet, the American Quartet (also known as the Premier Quartet), and Elsie Baker, in addition to his solo work. 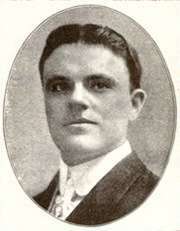 Nicknamed "The Denver Nightingale", Murray had a strong tenor voice with excellent enunciation and a more conversational delivery than common with bel canto singers of the era. On comic songs he often deliberately sang slightly flat, which he felt helped the comic effect. Although he often performed romantic numbers and ballads which sold well, his comedy and novelty song recordings continue to be popular with later generations of record collectors. Murray's popularity faded as public taste changed and recording technology advanced; the rise of the electric microphone in the mid-1920s coincided with the era of the crooners. His "hammering" style, as he called it, essentially yelling the song into an acoustic recording horn, did not work in the electrical era, and he had to learn to soften his voice. Though his singing style was less in demand, he continued to find recording work. 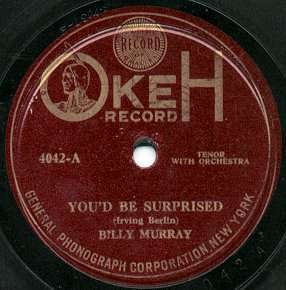 By the late 1920s and early 1930s, the music from his early days was considered nostalgic (the modern term would be "oldies") and Murray was in demand again. He did voices for animated cartoons, especially the popular "follow the bouncing ball" sing-along cartoons and the Fleischer Studios character Bimbo. He also did radio work. In 1929, Murray and Walter Scanlon provided the voices for the Fleischer short animation film Finding His Voice, produced by Western Electric. Murray made his last recordings for Beacon Records on February 11, 1943 with Jewish dialect comedian Monroe Silver. He retired the next year to Freeport, Long Island, New York, because of heart problems. He died at nearby Jones Beach of a heart attack in 1954 at the age of 77. Murray had married three times, the first two ending in divorce. He was survived by his third wife, Madeleine, and is buried in the Cemetery of the Holy Rood in Westbury, New York. "Ain't It Funny What a Difference Just a Few Hours Make"
"Always Leave Them Laughing When You Say Goodbye"
"Any Little Girl, That's a Nice Little Girl, is the Right Little Girl For Me"
"At the Moving Picture Ball"
"Clap Hands! Here Comes Charley!" "He'd Have to Get Under — Get Out and Get Under (to Fix Up His Automobile)"
"He Goes to Church on Sunday"
"He May Be Old, But He's Got Young Ideas"
"Hello, Hawaii, How Are You?" "I'm Afraid to Come Home in the Dark"
"In the Land of the Buffalo"
"It's the Same Old Shillelagh"
"It Takes the Irish to Beat the Dutch"
"I've Been Floating Down the Old Green River"
"Meet Me Down at Luna, Lena"
"The Little Ford Just Rambled Right Along"
"The Grand Old Rag (Flag)"
↑ Ruhlmann, William. "Billy Murray". Allmusic. Retrieved October 14, 2011. 1 2 3 "Billy Murray: A Biography". The Official Website of Billy Murray (1877-1954). Phonostalgia. Retrieved October 14, 2011. ↑ "The Walter Lantz Cartune Encyclopedia: 1930". The Walter Lantz Cartune Encyclopedia. Retrieved 2011-04-24. ↑ Barna, Ryan. "BILLY MURRAY'S RADIO PROGRAMS: Walter Scanlon and Marcella Shields". The Official Website of Billy Murray (1877-1954). Phonostalgia. Retrieved October 14, 2011. ↑ "BILLY MURRAY DISCOGRAPHY: Victor Records (1903-1913)". 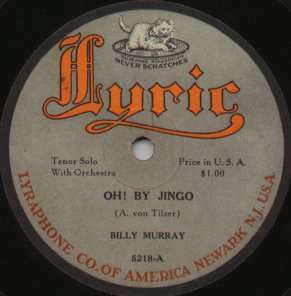 THE OFFICIAL WEBSITE OF BILLY MURRAY (1877-1954). Retrieved October 7, 2011. ↑ "The Little Ford Rambled Right Along". Model T Music & Lyrics. fordmodelt.net. Wikimedia Commons has media related to Billy Murray. Billy Murray recording of "He'd Have to Get Out and Get Under to Fix up His Automobile"
Billy Murray cylinder recordings, from the Cylinder Preservation and Digitization Project at the University of California, Santa Barbara Library.